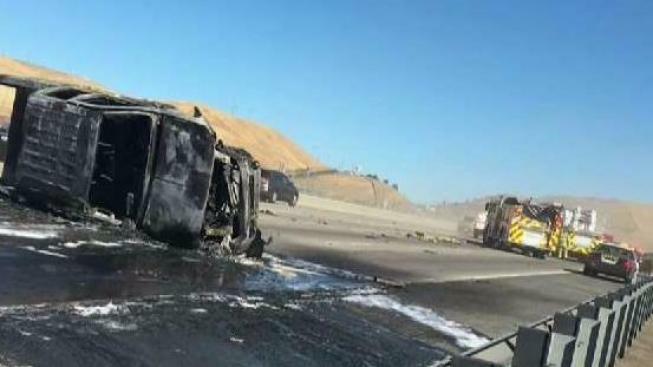 A Ford truck driving in the wrong lanes on eastbound Highway 4 in Concord collided with a red SUV and became fully engulfed in flames Saturday afternoon. A Ford pickup truck driving in the wrong lanes along eastbound Highway 4 in Concord collided with a red SUV and became fully engulfed in flames Saturday afternoon. By the time CHP arrived the driver had already fled the scene and the Contra Costa County sheriff's office is currently searching for him. According to officials, multiple parties were injured in the collision and transported to the hospital. There were no life-threatening injuries. Officials say the initial investigation revealed that officers were attempting to pull over the Ford pick up truck because it had been reported stolen. The suspect is described as a male adult in his mid-twenties wearing a hooded sweatshirt and blue jeans. Officials ask that anyone with information regarding the incident contact Contra Costa CHP or the Contra Costa sheriff's office.